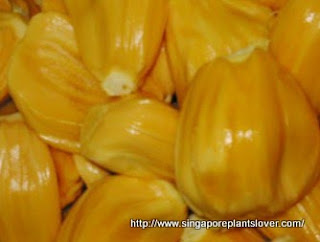 ABC Wednesday this week is for letter J, I would like to share with you one of my favorite fruit Jackfruit. Jackfruit is also called "Nangka" in Malay, native to parts of Southern and Southeast Asia, one of the favourite fruits of Singaporeans, this tree is often seen in gardens or park, even some of the HDB housing estate. Some found growing in the wild like at our nature reserves or those locations of villages in the history, like punggol. The tree can grow up to 20 meters, dark glossy shiny green leaves in oval shape with only a blunt tip. 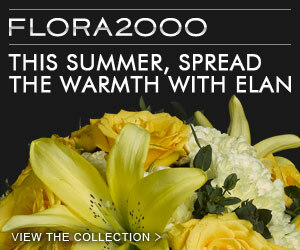 Flowers are small (2-3cm) with male and female flowers in clusters. The fruits are barrel- or pear-shaped, in golden yellow colour when ripe, big and long, at least 25 cm in diameter but can be up to 1 meter long, covered with small sharp conical warts. One of the interesting fact of this fruit tree, if you notice in my picture, the fruits can grow in the very low part of the tree, some even touch the ground. The fruits have a very strong smell when ripe. The flavor is sweet, a bit like pineapple, but with a strong, fruity aroma and taste, but some people just simply reject them. It is such a fruit that either you love it much or you hate it. All part of the fruit can be eaten, the pulp can be eaten unripe (young) when cooked, or ripe uncooked. The seeds may be boiled or baked, taste like chestnut. This is one of my favorites fruit except the work of peeling the skin. I hate to do that. All parts of the plant exude a white sticky latex, it makes me so difficult to take out the succulent, yellow colored pulp, the knife or hands soon get gummed up. Sounds really cool - I wish I could have a taste. What season are they ripe? What an interesting fruit. I would love to taste one. Thanks for sharing. I would like to try tasting it sometime! Sounds like a fruit I'd like to taste! I'm not a big fan of jackfruit but would eat them occasionally. Now you can buy them pre-cut and packed . I love langka or jack fruit! My take on J, please come and see. I never heard of Jackfruit. Pretty cool.